Your favorite bouillon recipes deserve America's favorite bouillon. Bouillon can do wonders for almost any recipe. Meat, poultry, vegetable, sauce or gravy. 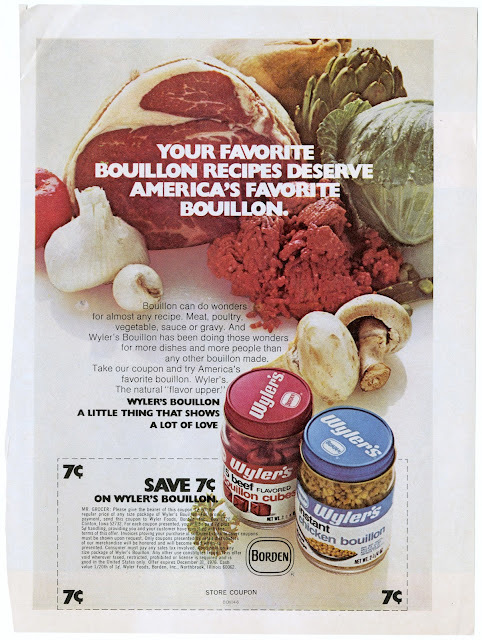 And Wyler's Bouillon has been doing those wonders for more dishes and more people than any other bouillon made. Take our coupon and try America's favorite bouillon. Wyler's. The natural "flavor upper." Wyler's Bouillon a little thing that shows a lot of love. A 7 cent coupon for Wyler's Bouillon is included at the bottom.